A CV joint is designed to transmit power to your car’s wheels while being able to flex in every direction. Your local Cottman center technicians are experts in CV joint service and CV boot replacement. That’s good to know, but it creates another, very important question: What exactly is a CV joint or CV boot? And, for that matter, does my car have them? A CV joint is a special type of axle joint, designed to transmit power to your car’s wheels while being able to flex in every direction. The CV joint is what allows a front wheel drive car to drive and turn at the same time. What is a CV Boot? A CV boot is a special, rubber covering designed to keep water and dirt out of the CV joint and keep grease in. If the boot tears, the CV joint can lose its lubrication and become contaminated. Of course, the bigger question is, how can you tell if you have a problem with your car’s CV joint or CV boot? One thing to look for is a tear in the boot. Another is a loud, grinding, growling, or clicking noise that only occurs when you turn the wheel. Of course, the easier choice is to take your car to your local Cottman center. Their technicians can check for indications of wear or damage to the CV joints or boots long before it reaches the point where it could cause an interruption in your car’s operation. Most important, they know when to repair your car’s CV joint or CV boot, and when it’s smarter — and cheaper! — simply to replace the axle. And they can provide you with a list of those options and help you make the right choice. 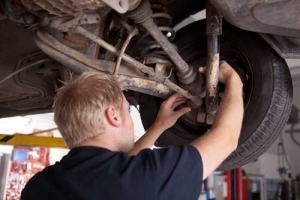 And, if you bring your car to your local Cottman center for your regular service, you can be sure their technicians will check the CV joints and boots for any obvious damage, every time you have your car’s oil changed. So, if you suspect a problem with your car’s CV joints or CV boots, or even if you’d just like a second opinion on their condition, there’s just one place to take your car: your local Cottman center.